Centifolia Rose Shard Orgniac Rich Cream, with a subtle fragrance, gives your skin hydration and light! Its richness in pink centifolia naturally sublimates the complexion by bringing him a coup de brilliance. Also composed of hyaluronic acid and vitamin C with smoothing and antioxidant properties, it deeply hydrates the skin and prevents it from drying out. It protects the skin from free radicals and thus fights against cellular aging. Its rich and unctuous texture is a real caress for the skin. Your skin regains all its comfort. 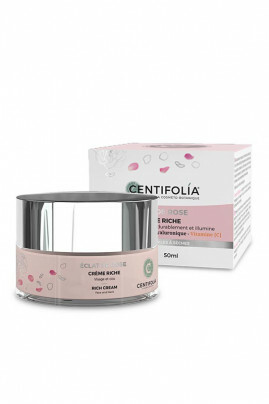 Smooth, radiant and hydrated skin thanks to the natural complex of Centifolia Rose Shard Orgniac Rich Cream! Ideal for normal to dry skin, including sensitive skin that wants softness. Centifolia Rose Shard Orgniac Rich Cream provides a luminous complexion! Apply the organic rich cream on your face previously cleaned and cleansed. To activate blood circulation, massage your skin with slight circular motions during application. A moisturizing face cream with organic ingredients! Aqua, Aloe Barbadensis Leaf Juice*, Caprylic/Capric Triglyceride, Dicaprylyl Carbonate, Butyrospermum Parkii Butter*, Polyglyceryl-3 Rice Branate, Glycerin, Glyceryl Stearate, Palmitic Acid, Stearic Acid, Rosa Centifolia Flower Extract*, Prunus Persica Leaf Extract*, Pyrus Malus Fruit Extract*, Rubus Idaeus Fruit Extract*, Helianthus Annuus Seed Oil, Sodium Hyaluronate, Tocopherol, Ascorbyl Glucoside, Myristic Acid, Lauric Acid, Oryza Sativa Hull Powder, Alcohol**, Xanthan Gum, Dehydroacetic Acid, Sodium Hydroxide, Citral, Parfum, Benzyl Alcohol, Benzyl Salicylate, Citronellol, Geraniol, Limonene, Linalool, Mica, CI 77491.